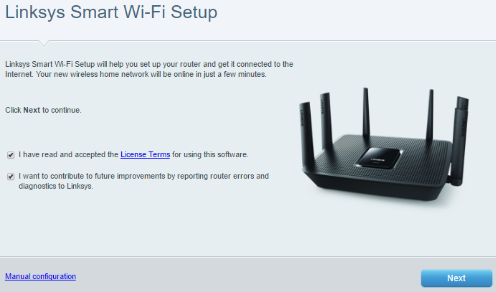 Setting up the Linksys EA9300 Max-Stream AC4000 Tri-Band Wi-Fi Router is made easy using the Smart Setup wizard which is embedded in the router's firmware and is available even if the router does not have an internet connection or the router is on factory default settings. Power on your modem and connect an ethernet cable from the modem to the internet port of the router. If you are replacing an existing router, make sure to disconnect and remove the old one. Connect the power adapter to the router and turn it ON. Wait until the Linksys logo light is solid. To know more about the light behavior of the Linksys EA9300, click here. 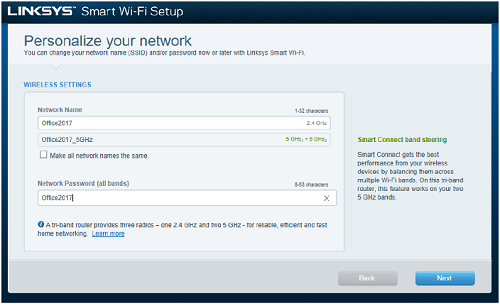 Connect a wireless computer, tablet or smartphone to the default Wi-Fi of your router. The Wi-Fi credentials are located on a label at the bottom of the device. NOTE: If you need to set up the router using a hardwired computer, connect your computer to one of the ethernet ports at the back of the router. 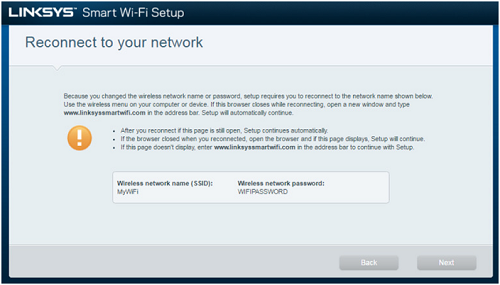 Launch a supported web browser and enter “linksyssmartwifi.com” in the Address bar then press [Enter]. NOTE: You can also enter “http://192.168.1.1” or “myrouter.local”. Check the box beside I have read and accepted the License Terms for using this software. Then click Next to proceed. NOTE: Open the link to know the license terms and other information. 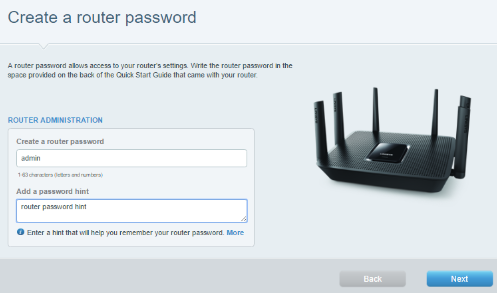 If you prefer to manually set up the router, click on the Manual configuration link. The Smart Setup wizard will now start to detect your internet connection. 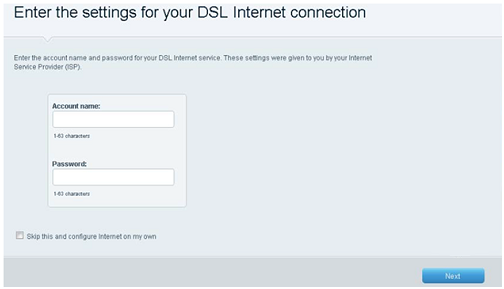 QUICK TIP: For some Digital Subscriber Line (DSL) customers, the setup will prompt for an Account name and Password from your internet service provider (ISP). Enter the necessary information then click Next to continue. NOTE: Once an internet connection is detected, your router will check for firmware updates. In the Updates for your router window, the Install future router updates automatically (recommended) is checked by default; this allows automatic updates in the future. You can always change this option later. Click Next to proceed. Enter your new Wi-Fi Network Name and Network Password. These will apply for both the 2.4 GHz and 5 GHz bands. Click Next once done. If you need to create a unique Wi-Fi name for your 5 GHz network, you can do so after setup by logging in to the router's web-based setup page. Reconnect to your network. Now that your router has a new Wi-Fi name, you will need to connect your wireless device to it and enter the password to continue with setup. After you have connected to the new Wi-Fi settings, click Next. NOTE: If you are using a wired computer, it will proceed to the next step. Create a new router password and password hint and click Next. QUICK TIP: This is your router’s local administrator password. NOTE: The password hint is visible when you locally log in to the router, so make sure you don’t use your actual password. 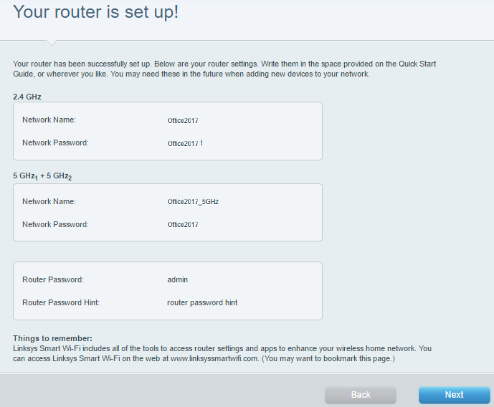 After setup, your password hint is now available on the Connectivity tool of your Linksys cloud account. For instructions on how to change your password hint, click here. Your router is set up! Ensure that you write down the new settings for future reference. 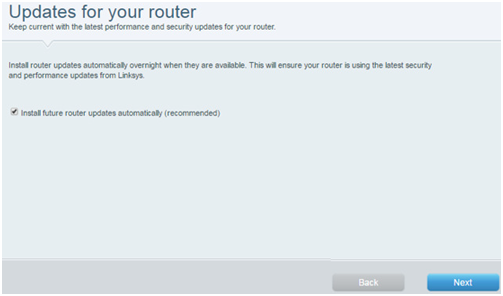 NOTE: After clicking Next, you will be redirected to create your Linksys cloud account. For step-by-step instructions on how to do this, click here.